Using local and national news articles, and limiting our search to only eight of the many chemicals Dourson has been paid by industry to study, we identified 107 locations in 49 states. Each location is a place where a news story refers to one of the eight chemicals polluting the water, soil, or air or poisoning residents or workers in the area. Our results – displayed in the map below – are by no means comprehensive, and represent only a fraction of locations affected by chemicals Dourson has worked on for industry clients. 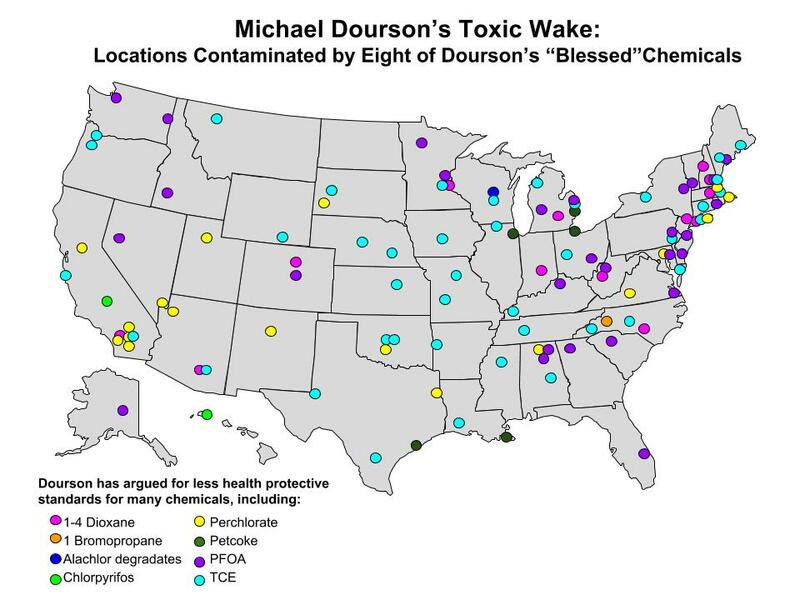 The map reveals that the entire country has experienced direct impacts from chemicals that Dourson has argued should have less health-protective standards. For a full list of the news articles and chemical contamination locations by state, click here. In addition, Environmental Working Group (EWG) has posted interactive maps showing the extent of tap water contamination with 2 of these chemicals, 1-4 dioxane and PFOA, across the nation. 1,4-dioxane in southeastern Los Angeles County, California: Based on testing by the U.S. Geological Survey reported by EWG, southeastern LA County is one of the hot spots for 1,4-dioxane contamination in tap water across the country. Concentrations found in area water systems ranged from 4-14 times the EPA’s cancer risk level. 1-Bromopropane (1-BP) in North Carolina: From the 1990s through the 2000s, OSHA found employees at Royale Comfort Seating Plants in North Carolina were exposed to dangerous levels of 1-BP while working. As of 2011, the company had paid nearly a half-million dollars in court settlements and necessary upgrades. Alachlor degradates in Wisconsin groundwater: Statewide testing in Wisconsin revealed degradation products of alachlor –which is a widely used herbicide – across the state in groundwater and wells. The “ESA” degradate of alachlor was the second most commonly detected pesticide in the wells tested. Chlorpyrifos in Kauai, Hawaii: EPA filed a complaint with the pesticide producer, Syngenta, in 2016 following a pesticide poisoning on a farm in Kauai. Several farmworkers were hospitalized after dangerous exposure to chlorpyrifos. Perchlorate in the Southwest: In 1997, EPA discovered high perchlorate levels in the lower Colorado River and Lake Mead, which provides drinking water to millions in the region. The contamination came from two perchlorate manufacturing facilities in the area, and efforts to clean up the tainted surface water and groundwater are ongoing. Perfluorooctanoic acid (PFOA) in Hoosick Falls, NY: High levels of PFOA were discovered in the Hoosick Falls community’s groundwater, originating from the Saint-Gobain Performance Plastics facility. In 2017, EPA added the location to the Federal Superfund List. Petroleum coke (Petcoke) in Plaquemines Parish area, Louisiana: United Bulk, a coal export facility, was sued in 2014 for discharging coal and petcoke from its facility in Plaquemines Parish into the Mississippi River. The lawsuit was settled in 2015. Petcoke in Chicago, Illinois: In 2013, Chicago residents reported concern over windblown dust from piles of petcoke owned by KCBX terminals – a Koch subsidiary – on the city’s Southeast side. One of the facilities has since closed and the other no longer stores petcoke in the open. Trichloroethylene (TCE) in the Cheyenne area, Wyoming: TCE was found in the groundwater around several of the Atlas Missile sites – used during the Cold War to hold and prepare nuclear missiles – in the early 2000s. A plume from one site had concentrations of TCE approximately 48,000 times the legal limit. Communities affected by Dourson “blessed” chemicals should urge their Senators to oppose Dourson’s appointment. We need strong leadership in the EPA toxics office to ensure successful implementation of the newly reformed TSCA and to protect the health of all Americans from toxic chemicals and pesticides. Otherwise, with Michael Dourson in charge, we’ll just see an even bigger toxic wake. This entry was posted in EPA, Health Policy, Industry Influence, States, TSCA Reform and tagged Dourson. Bookmark the permalink. Both comments and trackbacks are currently closed.